As my sister headed off to sunny France for a week she bequeathed to me some ingredients that wouldn't keep for the duration of her absence, one of which was a packet of baby portobello mushrooms. Knowing I also had some halloumi in the fridge and plenty of garlic, I decided I must use up the mushrooms with great haste and made this delicious warm salad. This was partly inspired by a friend's recent barbeque, where I was reminded just how well mushrooms and halloumi go together. Turn the grill on to medium/high then brush off any dirt from the mushrooms. Crush the garlic and distribute evenly across all the mushrooms. Season with salt and pepper then drizzle with a little olive oil. Place under the grill for 5-10 minutes, until the mushrooms are cooked and the garlic is lightly browned in places but not burned. 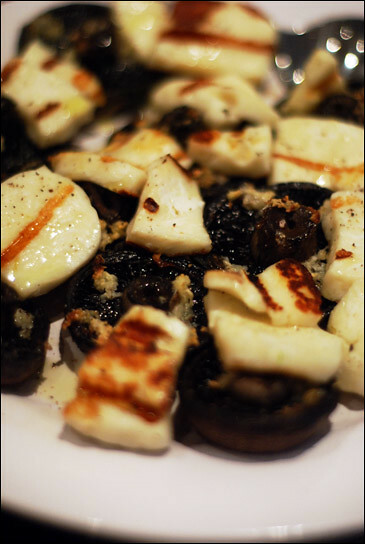 Set the mushrooms aside on a plate to cool, then griddle the halloumi for 3-5 minutes, until slightly softened, with griddle lines across the surface. Scatter over the mushrooms, drizzle a little more olive oil on top and serve. I found these were ideal as part of a selection of mezze-type dishes. I bought halloumi for the first time last week and just fried some chunks of it with loads of black pepper - it's delicious! I like the idea of having it with mushrooms too...cheese and mushrooms - two of my favourite things!